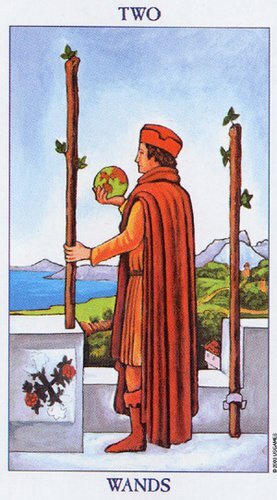 This card depicts the image of a man standing between two wands or staves examining the world globe in his right hand as he looks out over a vast body of water. These pillars between which he is standing is reminiscent of the pillars of Hercules that flank the entrance to the Strait of Gibraltar, upon which was inscribed the warning “Non plus ultra” meaning nothing further beyond. This served as a waring to sailors and navigators to go no further. In medieval times most people lived on the Mediterranean, with Morocco to their left and Spain to their right, thereafter nothing but the vast Atlantic Ocean. The Atlantic Ocean was largely unexplored, it was the great unknown. There were no maps to navigate an explorer, thus a voyager would be entering the unknown with nothing but the stars to guide him. The man in this card could very well be standing at the Straits of Gibraltar, with the Mediterranean behind him, about to venture into an exploration of the unknown. Shifting paradigms. There comes a time when each of us must stand between the pillars of Hercules where we embark on new idea, new sciences, new thought; and find the courage of our conviction to step through and into new paradigms of discovery. One such man was Christopher Columbus who – being Italian – approached the Italian aristocracy for financial support on his envisioned exploration of discovery. They scorned him and withheld their support. After all the church did not encourage its people to embark on such explorations. The fear of new knowledge and influences brought into a society under the firm control of the church was far too great. The world, they said, was flat, and the fate of anyone who dared to explore the great unknown Atlantic Ocean was to drop off the end of the earth. Not deterred and more determined than ever, Columbus turned to the Spanish Royal family for support. They were more adventurous and generous, financing his fleets the supplies needed onboard and the wages for his crews. Columbus ventured forward, exploring new paradigms against great adversity and fear of the unknown, ultimately resulting in the discovery of North America. 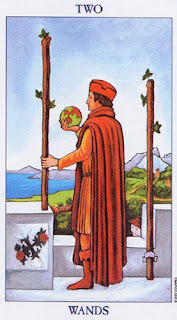 The suit of Wands represents action. It informs us that now is the time to act on our convictions. Time to step through these Pillars of Hercules that represent new paradigms of ideas. It is time to explore those ideas, allowing them to take us on a journey of discovery. Who knows what we may discover about ourselves and our world if we dare to question what we think we already know. Another interesting and eye-opening take. I like your analogies, though wryly thought that the actual Spanish monarchy were not the ones who benefited most from Columbus's discoveries.